Spring is here! And the warmer weather beckons the desire to head into the great outdoors. 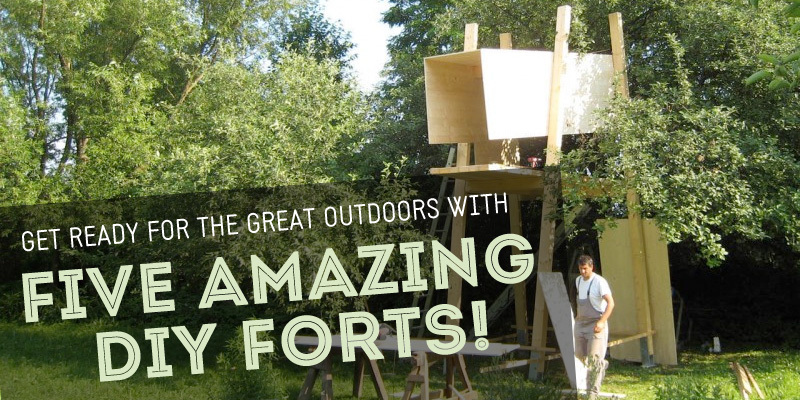 These 5 fantastic DIY forts will offer respite for young adventurers and a place to make childhood memories that will be treasured for a lifetime. Read on to learn how to make amazing play spaces under the big blue sky, from a tree-less house to a play hive! VISIT 100 Wild Huts for step-by-step instructions. VISIT ArchDaily for a pictorial. Like a warm weather igloo, the Play Hive, by ThoughtBarn, is a cool summer getaway durable enough to withstand winters outdoors. This is a permanent structure, so take that into consideration when going through the extremely detailed modular instructions. Because it is comprised of varied lengths of 2x4s, the wood can easily be sourced from re-purposing yards (versus buying new pieces from the hardware store). CLICK HERE for detailed PDF instructions. 1) WILD HUTS! As the name suggests, the founders of 100 Wild Huts have challenged themselves to create 100 wilderness structures over an extended period of time. While the site offers numerous choices when it comes to basic survival construction, Wild Hut 19 stands out because as the creators note, "in order to push ourselves we decided to build a mathematically complex geodesic dome... from wobbly twigs. " A huge part of the design process is actually being out in the elements in which "tall trees had been knocked down by the wind in an elemental game of woodland dominos." 2) TREE-LESS-HOUSE This fabulous design by Robert Potokar and Janez Breznik "is a wooden play structure that is elevated without requiring nearby trees to support its weight." Like an AT-AT frozen in mid stride, the tall structure provides a fabulous vantage point from which kids can survey what will one day all be theirs. "The design was guided by the goal of creating interesting and different spatial experiences for children that inspire new forms of play." 3) FLAT PACK TREE HOUSE Imagine constructing a tree house without nails, screws, nuts, bolts, or any other hardware for that matter. Designed by Rogier Martens & Sam van Veluw is a play space for kids that doesn't harm the environment. "It is a tree friendly tree house and easy to build using straps and lashings. The whole package consists of 7 panels, 4 straps and lashings and a manual. The construction of the tree house takes about 30 to 45 minutes." 4) THE PLAY HIVE Like a warm weather igloo, the Play Hive, by ThoughtBarn, is a cool summer getaway durable enough to withstand winters outdoors. This is a permanent structure, so take that into consideration when going through the extremely detailed modular instructions. Because it is comprised of varied lengths of 2x4s, the wood can easily be sourced from re-purposing yards (versus buying new pieces from the hardware store). 5) CARDBOARD CUBBY Got 12 foot pieces of cardboard laying around your warehouse, or have you recently purchased several refrigerators? If that's the case, then the Super Colossal Cubby is the ideal project for you. Comprised of 7 monolithic structures that scrape the sky, the cubby provides shade during sunny summer days. Constructed from cardboard, the architects recognize its lack of durability by describing it as, "a prototype for a flat-pack cubby house, made of cardboard that could be recycled easily once it is no longer fun, or when it rains, whichever comes first."